Logo: Grow what we eat; eat what we grow. 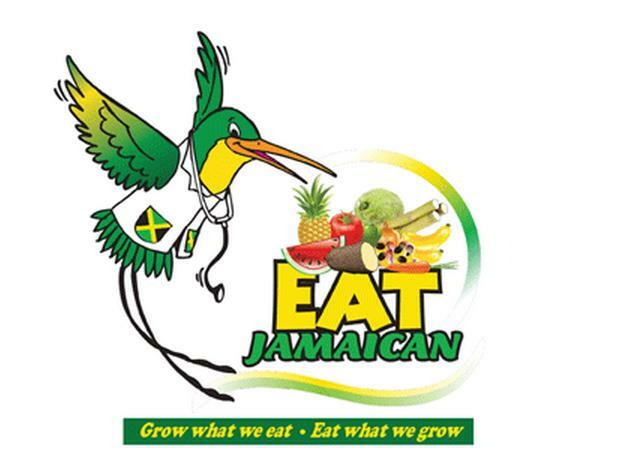 The ‘Eat Jamaican’ campaign, with its catchy slogan: “grow what we eat, eat what we grow” celebrates its 10th anniversary this year. When the campaign was launched in 2003, by the Jamaica Agricultural Society, November 25 was declared Eat Jamaican Day in Jamaica. This year to commemorate the 10th anniversary, November is being recognized as Eat Jamaican Month. And there will be several special events to celebrate the occasion. The “grow what we eat” message is not totally new as we learn it has been seen before, since Jamaica’s independence. A venture of this kind also has the effect of bringing down the cost of the import bill for agricultural produce, which has been showing a decline over the last two years. I wonder if the concept of grow what you eat and eat what you grow applies to people like me. I believe that if this concept became law, I would surely die of starvation. REGARDLESS OF who first publicly proposed the concept of ‘eating what you can grow’, it is a good one. The campaign has used various strategies for promoting its message: road shows, essay writing, quizzes and cooking competitions, and special day observances. Jamaica also hosts several food festivals annually - Trelawny Yam Festival, Port Royal Seafood Festival, Little Ochie Seafood Festival, Portland Jerk Festival, and St Mary Breadfuit Festival to name a few. The “Eat Jamaican” campaign has been implemented in part to address Jamaica’s rising food import bill. According to the Statistical Institute of Jamaica (STATIN), during January to May 2013, Jamaica’s food import bill rose by 7 per cent. Total food imports during that period was US$421million, up from US$394 million for the same period in 2012. What does this mean for the effectiveness of the “Eat Jamaican” campaign? To re-establish the fact that Jamaica is an agricultural country; that our richest heritage accrues from rural farming communities; that all our best attitudes and values are to be found in the traditional Jamaican ‘country life’; and that central to our Jamaican culture is the food that we produce and the ways in which we prepare them. To remind those who have forgotten and inform those who are too young to know, of the dimensions of Jamaica’s farming sector, the colourful threads of this broad fabric from the small subsistent farmer to the large farming operations; the economic importance in terms of jobs and income generation; the success stories, as well as the struggle for survival. To celebrate the glories of Jamaican cuisine culture, many examples of which are the heart and soul of Food Festivals. To lift the morale of our farmers and their communities, re-awaken their appetite for production, while, at the same time, attracting new and young farmers to the sector. In this process the JAS itself should be repositioned as the viable and relevant farmers’ organization adding value to its membership by helping to create an atmosphere where wealth can be generated for all through the influencing of policies that will benefit the sector. These objectives are rather broad. How have these objectives been measured over the 10-year period of the campaign? Are more Jamaicans eating Jamaican food? No doubt, many Jamaicans will recall the “eat what we grow” message, but how many actually eat Jamaican food? Going forward, the “Eat Jamaican” campaign will need to revisit its objectives and ensure that they are measurable and behaviourally focused. Audience segmentation will need to be incorporated as a key campaign strategy to ensure that messages are tailored for different segments of the Jamaican population – for example, those who are already eating Jamaican food regularly and need to maintain this behaviour versus those who are not eating Jamaican food as often as they could, and find it difficult to do so; or those who already engage in gardening versus those who don’t. How about a specific objective that encourages Jamaicans to eat meals with Jamaican food at least five days per week? Or a measurable objective that focuses on promoting the behaviour of home gardening or other agricultural activities? Assuming that many Jamaicans are already aware of the need to ‘eat what we grow’, the Jamaican Ministry of Agriculture and Fisheries along with the Jamaica Agricultural Society must now focus efforts on influencing the gardening and eating behaviours of Jamaicans. When I was growing up in the hills of St. Catherine most times we had no choice, but to eat what we grow. Now i know if we eat what we grow the farmers in several areas all over the country will be better able to send their children to school. My family grew Irish Potatoes in the hills of Guys Hill, I have some stories (for another time) how we had to run yes run home from school, (Mt. Nebo) to come cut plant and water the potatoes. Now trust me when i see local potatoes i am going to buy them so maybe just maybe, another little boy or girl may be able to enter Dinthill, St. Jago, St. Mary, Guys Hill Secondary or any other school of their choice..